Posted by Wendy in Resort Review. I just had one of the best ski days of my life. And it wasn’t at the gnarliest hill on the planet, nor one that’s particularly exotic or remote. It was at Bretton Woods, New Hampshire. 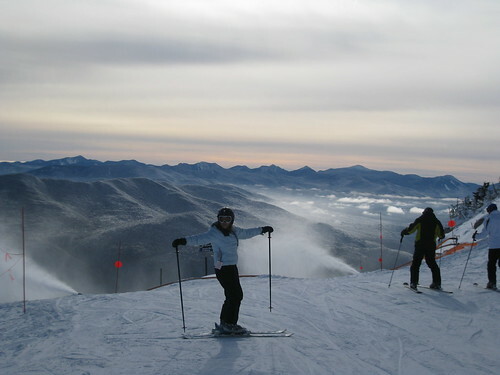 For those of you who don’t know, Bretton Woods is a mellow, modest-sized ski area tucked in the shadow of Mount Washington, the highest peak in the northeastern United States. 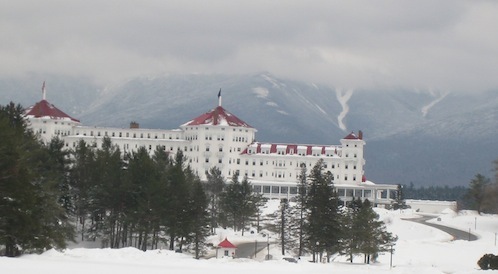 The area is known for the magnificent Mount Washington Hotel, site of the historic Bretton Woods conference of 1944, which established rules for commercial and financial relations among the world’s major industrial states (To find out more, go here. 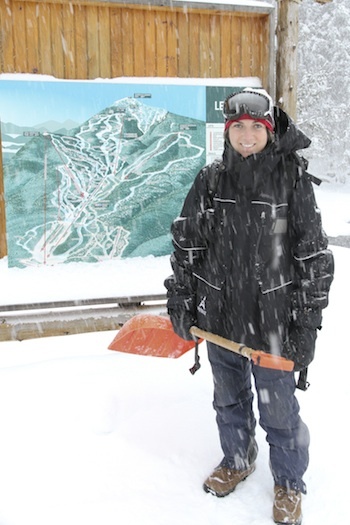 But since this is a ski blog, let’s move on.). The ski area, not so much. Though the sign to at the entrance to Bretton Woods proclaims “The largest ski area in NH,” it’s really fairly small. The vertical is only 1,500 feet and it’s a mere 464 acres. But the size of the place — or lack thereof — wasn’t the reason we chose to come. We came on account of the trees. For those of you who don’t know me, let me confess: I’m a bit of a wuss. You know that risk gene that causes people to huck cliffs and hurtle down 90° precipices? I don’t have it. I’m a decent enough skier, but let’s just put it this way. I know my limits. And skiing in densely packed trees is one of them. For me, Bretton Woods was perfect. There are glades for all sorts of abilities. You want steep and dense? Check. Prefer something tamer ? Check on that, too. At Bretton Woods, I became a tree fiend. Plus conditions were amazing. It was absolutely dumping snow. Our tracks filled in almost as soon as we made them. We were giggling. Howling, Chortling with glee. In short, we experienced pure, unadulterated, joy. One of the best ski days I’ve ever had. As I said before, size isn’t everything. Don’t turn up your nose if a ski area isn’t the biggest one around. You may have your own Ode to Joy. Sometimes it really pays to be the Ski Diva. Take recently. The Olympic Regional Authority (ORDA) of New York State invited me to take a press tour of Lake Placid and Whiteface Mountain. I’d never been there, so I figured why not. A better question is, why hadn’t I been there before? If I knew what I’d been missing, I wouldn’t have waited so long. Some of you are already familiar with the area. You’re either local or have already paid a visit. Well, you’re smarter than I am. Olympic facilities are everywhere. 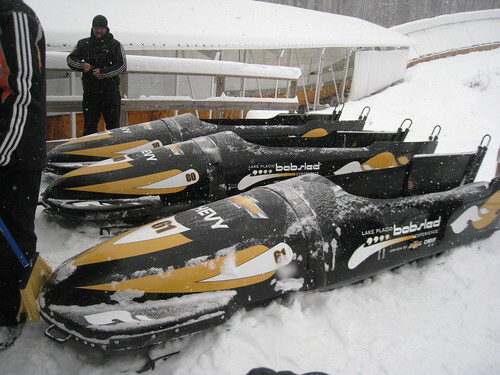 You can ski the Olympic Downhill, take the Olympic bobsled ride (which I did, without throwing up OR screaming. Go here), see the HUGE Olympic ski jumps (holy height anxiety), cross country ski where the Olympians do. It’s incredible and humbling –- all at the same time — that mere mortals can play where Olympians play. 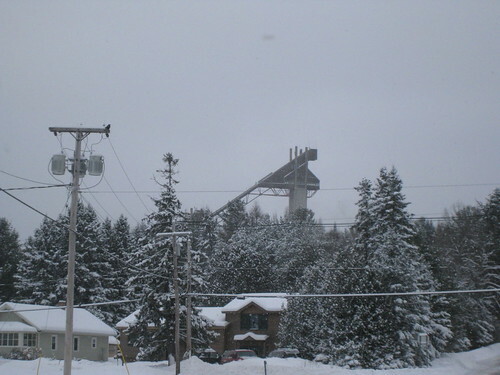 Here’s a picture of the ski jump, by the way, which does not do it justice. I skied with a young woman who was an ex-ski jumper. She seemed to think it was nothing out of the ordinary. Can you imagine?? If you’re looking for a special place in a gorgeous setting, this is it. 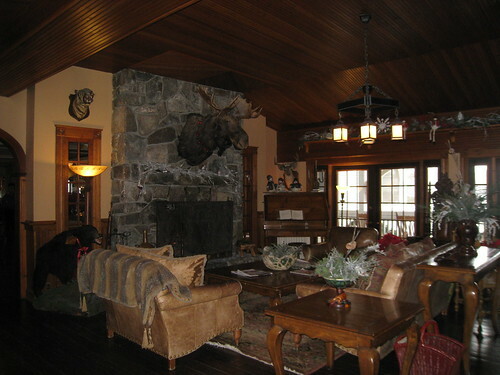 Conde Nast named it one of the best places to ski and stay in North America (it was #12), and I’m not surprised. The service is stellar. 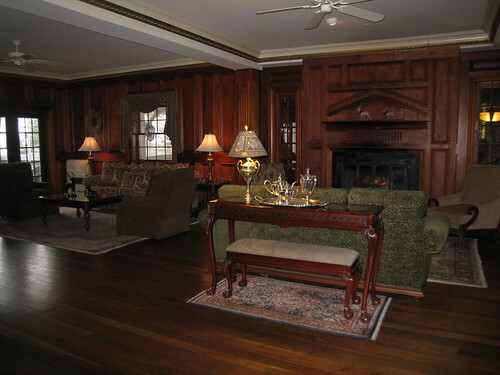 The staff is attentive, friendly, and willing to do anything to make your stay as pleasant as possible. There are home-made chocolate chip cookies at the front desk, all day long. A four diamond restaurant with terrific food. A great bar and a pub across the street. Ice skating. A fantastic spa, where I had the most amazing facial and chilled out (or heated up) in a eucalyptus steam bath. Amazing rooms, with a few extra-spectacular ones in a couple free-standing buildings across the street, directly on the lake shore (yes, we were given a tour). I could see this as being a great destination, whatever the season. Seriously, this is one of the best places I’ve ever stayed. I know I sound like I’m gushing, but really, it’s that good. HIGHLY recommend. I will be back, next time with my husband in tow. So, now for the activities. 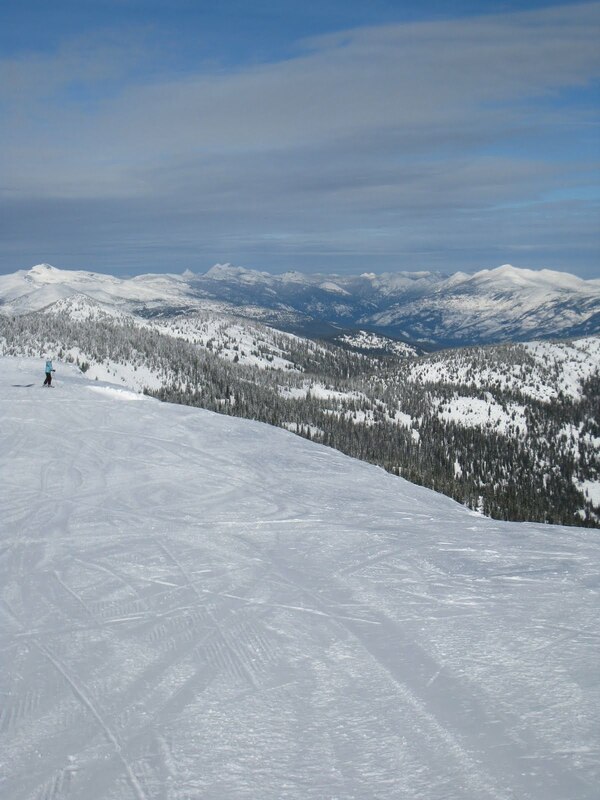 1) Skiing. At Whiteface. For years I’ve heard Whiteface dissed as Iceface. Which is one of the reasons I never wanted to go there. To that I now respond: they had the Olympics here for a reason. Twice. So don’t sell it short. As for “Iceface:” if that referred to conditions, well, this is the East. Like it or not, you’re going to get ice…..er, I mean hardpack. But there have been tremendous advances in snowmaking and grooming, so let’s give it up already. If “Iceface” refers to cold, well, yes, you’ll find that, too. Again, this is the Northeast. You either get used to skiing in the cold, or you stay home and wait for summer. That’s just how it is. That’s why God invented things like down and boot heaters. And there is a Gondola, which definitely helps. To be honest, I think I probably hit the three best days of the year, weatherwise. The first day it was sunny and clear, not cold, and no wind. No one could believe how fantastic it was. From the summit, you could see all the way to Mount Mansfield in Vermont (that’s where Stowe is), a distance of I’d guess about 80 miles. The second day it snowed like crazy all day: 20 inches of fresh powder. And the third, well, we reaped the benefits of Day #2. The skiing was positively awesome. Yes, I skied the Olympic Downhill, singing the Olympic theme song while imagining a cheering crowd and a gold medal waiting at the bottom. But I skied lots of other trails, too. There’s enough variety to keep you interested, and tons of fun. The only downside I can think of is that some of the lifts are kind of slow. But there is the gondola that I mentioned, which gets you to the top in a hurry. And the runs are nice and long, so that sort of makes up to it. The bottom line: this is one big mother of an Eastern mountain. 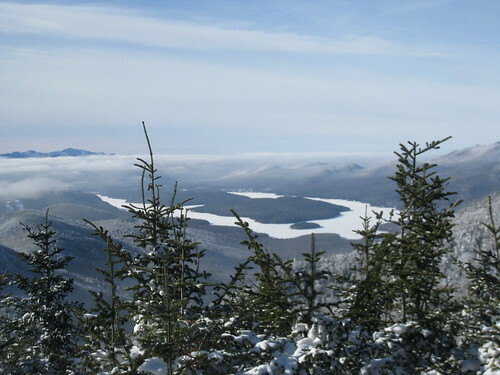 Whiteface boasts the East’s greatest vertical drop (3,430′). There’s a tremendous amount of great skiing here. You will have a blast. To be honest, I was a little nervous about this. I’m not a roller coaster person. But the bobsled action is more side to side than up and down, and before I got on I kept telling myself not to be scared. So I wasn’t. I’m glad I didn’t chicken out. It was an absolute blast. You don a helmet and squish in with two of your all of a sudden best friends, along with a guy in the front, who steers, and a brakeman who pushes you off and then hops on. People said it’d be over in a flash, and though it wasn’t quite like that, it was pretty quick, though you do have time to experience some amazing G-forces. Plus at the end they give you a T-shirt, a pin, and a picture of yourself, looking positively exuberant after your ride. How can you beat that? 3) SPA!!!!! 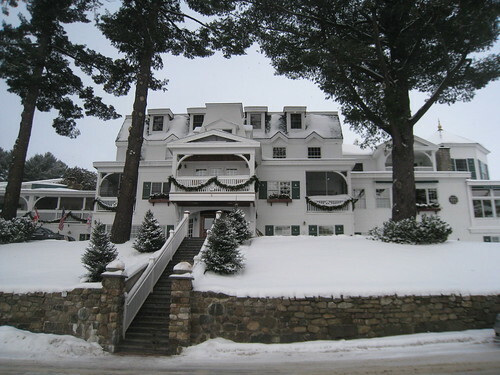 I’ve already talked about the Spa at the Mirror Lake Inn. To be honest, at first I wasn’t too keen on taking time away from skiing to do this. My husband had some advice, “Pretend you’re someone else. Someone less obsessed with skiing.” I think he meant enjoy what you’re doing, when you’re doing it, even if it’s not skiing. Consider me a convert. It was wonderful. So relaxing and great for your skin. You could feel the toxins and anxiety slipping away. After five minutes I was sure I must look five years younger. Why haven’t I been doing this all along? I could definitely get used to having facials on a regular basis. Why not. And the spa there is lovely. If you go, you have to give it a try. 4) Cross Country Skiing. Again, something I didn’t think I’d like. I mean, you’re on skis and you’re not going downhill? Give me a break. Consider me wrong about this, too (hey, at least I admit it!). There are miles and miles of cross country ski trails in Lake Placid. You could ski yourself silly. We had a wonderful guide at Mount Van Hoevenberg, which is part of the Olympic Sports Complex, who gave us excellent instruction and took us through miles and miles of winding, wooded trails. The snow was falling, the woods were beautiful. Ahhhhhhh. Another thing I could get used to. So there you have it. A trip that was absolutely stellar. If the intent of the Olympic Regional Development Authority was to get me excited about Lake Placid and all its wonderful activities, consider it done. 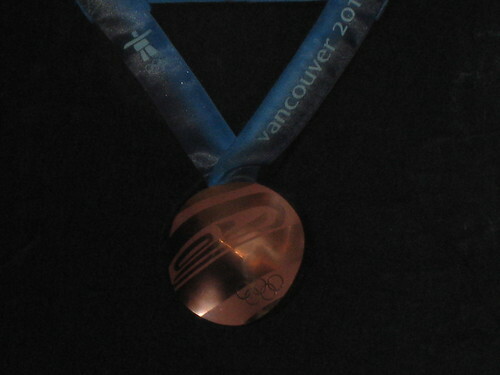 There is so much to do that I missed: dog sled rides on the ice, toboggan rides, ice skating (at the Olympic oval!). I think I’ll have to go back. Yep, I’m back from four days in north Idaho. Not the easiest place to get to from Vermont, but definitely well worth it. 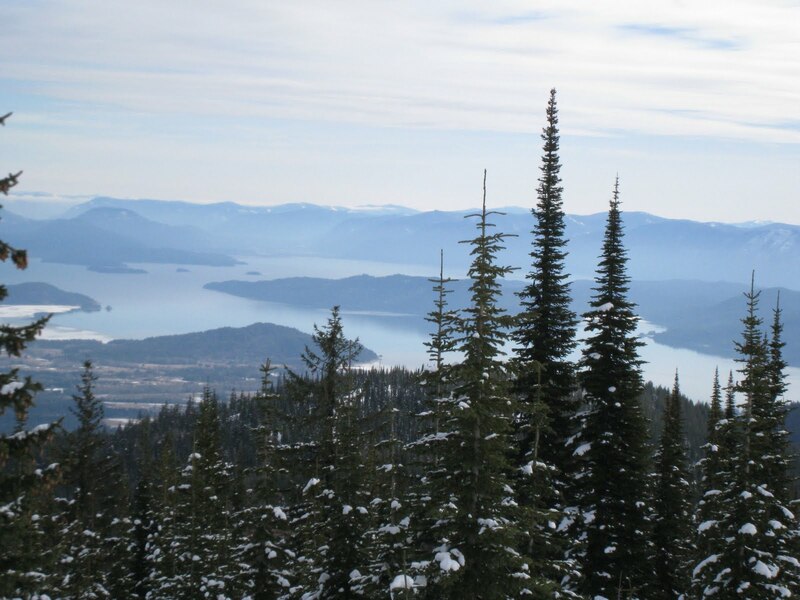 Schweitzer averages 300 inches of snow, and it’s way down this year. Still, there was a lot of snow and zero ice. And with temps in the low 30’s, no wind, and BLUE skies (I understand that’s very unusual there. 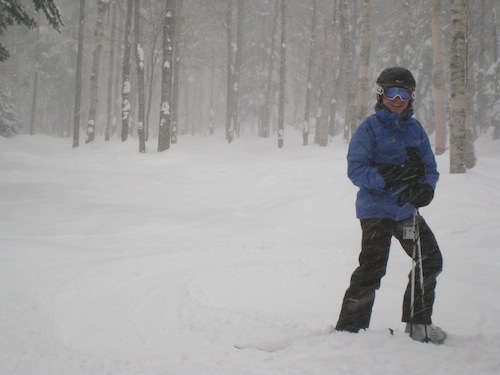 But it’s unusual in Vermont, too), it was especially pleasant skiing weather. Is it needless to say I had a great time? Well, I’ll say it, anyway. I had a great time. I give it two ski poles up.